You’re likely cleaning reels, spooling new line, and inventorying tackle. Please review these recommendations for proper handling and safe release of prized fish so you can catch them over and over. 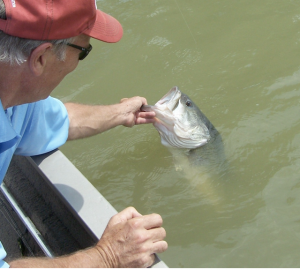 Keep big bass in water while releasing, especially during summer months. When landing a fish, do everything possible to remove the hook without damaging tissue. This is done more easily if you crimp the hook barb flat with the shank. If you deep-hook one, keep sturdy pliers on-hand to cut the hook. You can easily retie, but a big bass is too hard to replace. If the hook is stuck in a gill arch, use extreme caution. Gill filaments are highly vascular and bleed easily. Once a fish bleeds, its odds of survival drop significantly. One point that might help, unlike humans, fish blood coagulates much more quickly when fish are in the water. When attempting to keep fish alive in a livewell or dock basket, monitor water temperature and dissolved oxygen. Cool water holds more oxygen. Warm water holds less and can be very stressful. When handling fish, make sure your hands are wet. Fish have mucous coatings called slime coat. It’s the first line of defense against disease. Dry hands dislodge and remove slime. If holding fish in a livewell, don’t cool livewell temperature more than 10-degrees of lake water. Fish can tolerate changes from warm to cool easier and safer than cool to warm. Be familiar with these procedures during hot summer days. Don’t keep a fish out of water more than 30-seconds or its slime may dehydrate. If it must regenerate slime, immune systems can be taxed. Gene Gilliland, long-time fisheries biologist, helped write the B.A.S.S. book on handling fish. He makes a strong point to hold bass vertically by the lower jaw. Never try to hold one horizontally by the jaw. If the mouth is opened too wide, it can dislocate the jaw. 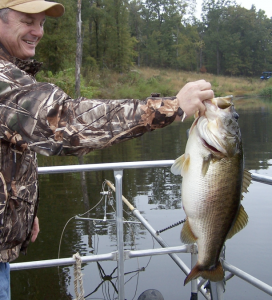 When landing bass over 5-pounds, use nets with vinyl material. Nylon netting is abrasive to the slime coat. Hold trophies vertically to prevent injuring their jaw. Ensure there is no sunscreen lotion or bug repellant on your hands. It can compromise slime. During the fight, a fish is stressed. Metabolism rises, muscles work hard; lactic acid and cortisol increase. The strain pushes release of stress hormones. When muscle tissue breaks down, the immune system becomes unstable. If you use a livewell, there are numerous products and additives to aid recovery. If you’re transferring fish between ponds, fill the transport tank with pond water, treat with proper additives, and be sure to aerate. Without proper aeration, they can suffocate quickly, again especially in warm weather. Call and visit with our biologists about safe methods. This entry was posted on Sunday, March 17th, 2019 at 2:43 pm	and is filed under News & Updates. You can follow any responses to this entry through the RSS 2.0 feed. Responses are currently closed, but you can trackback from your own site.